I’m way behind on getting ready for CMW, but thats how it goes. Scanning my inbox for whats happening this week, I across this unique event that I think you should know about. It’s called the Artist Select Series, presented by Young Lions Music Club and Red Bull Music Academy. The concept is simple; three of Canada’s top acts hand-pick a roster of artists for their own showcase, which they will then also host and DJ. 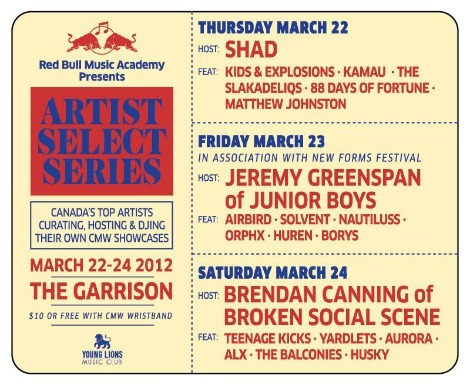 The acts are Shad (Thursday), Junior Boys (Friday), and Brendan Canning (Saturday). All at the Garrison. Here’s the facebook event. Take a listen to the bands at tumblr. Here’s a track from one of the artists performing, ALX, the yet-to-be-seen version Of Allie Hughes’ latest vision.